The sound of an audience laughing is a beautiful thing. Sitcom producers could have recorded a trove of wonderful reactions at Players of Utica last night. We also saw the magic of live theater – as the audience laughed, the performers got better and better, which continued the cycle. 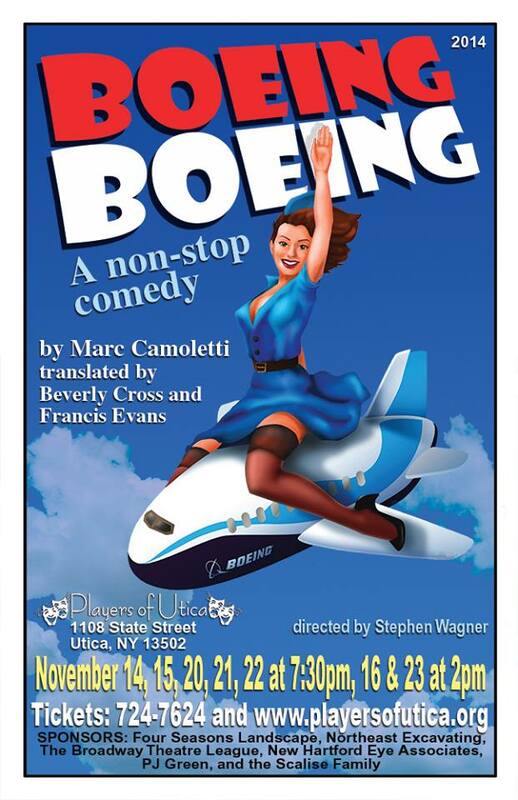 Boeing Boeing is a French farce that premiered in 1960, was translated into English in 1962, and by 1991 was listed in the Guinness Book of World Records as the most-performed French play in the world (according to Wikipedia). Playwright Marc Camoletti laboriously constructs his framework in the long opening scene – an American expatriate in Paris juggles three fiancés, all flight hostesses on rival airlines, using a book of timetables and a rotating picture frame to execute the deception. Farce is a delicate thing – like a soufflé. Once the pieces are in place, the dialogue and physical comedy need to be executed precisely and rapidly, and it should look easy. Dropped lines or hesitations spoil the flow, as well as actors who aren’t completely in synch with each other and the material. I saw two versions of Lend Me a Tenor a few years ago that I wish could have been combined – I still remember bits from each that I loved, without particularly loving either production on its own. Which is to say that producing a good farce is difficult and a bit rare. Director Stephen Wagner and company got about 80% of the way there, by my estimation – which is actually very good and shouldn’t be considered a putdown. At 2-1/2 hours, the show was about thirty minutes too long; half of that is the padded script, and half was pacing that should continue to improve throughout the run. A lot of the blocking, especially the fast entrances and exits, was spot-on. The Players seating configuration (chairs on risers) continues to be problematic for any action that involves actors lying on the couch or the floor – most of us past the first two rows couldn’t see what was happening. This was especially unfortunately in the case of the aforementioned picture frame. Changing the picture got funnier and funnier as the show went on, but I’ll bet a good share of the audience didn’t see it happening, because the frame was on a low end table. Eric Almleaf’s Bernard starts the play in a crimson Hugh Hefner smoking jacket, and I was initially disappointed not to get a comically exaggerated portrayal of Hef. As the plot winds itself up and Almleaf becomes more exasperated, his double-takes and googly eyes fall into stride and he’s quite good. Michael Burke’s Robert also has a slow start, especially during the exposition. Once the comedy gets physical, he displays a real talent for slapstick and scores some of the biggest laughs of the evening. The women are well matched and contrasted with one another, and the initial costuming of the flight hostesses is very nice. Hana Meyers is a 1960’s American pinup dream in blue, Deborah Martin is a lusty German goddess in yellow, and Carrie Bostick is a hot-blooded Italian in red. (The colors were so vibrant that I wished they had stayed consistent through the show, with color-matching nightgowns for Act Two.) I had no trouble imagining why Bernard would fall for all of them. Rachel Hasenauer’s Berthe rounds out the cast as the French maid in black and white – a good concept that matches thematically but doesn’t go far enough (the costume needed more frills). Usually accents are problematic in amateur theater, but a comedy with four women of four nationalities demands an attempt, and as long as the attempt is internally consistent it doesn’t have to be (Meryl) Streepian. Bostick and Martin both did a nice job, with Martin finding some good comedy in hers. I would have liked to hear some kind of French accent from Hasenauer – as it was, her character was semi-redundant given that Meyers was already portraying the 60’s French concept of a modern American woman. I expect this show to get better and better as lines and movement become second nature to the performers. As a night out, laughing with 100 others beats sitting on the couch and watching Seinfeld re-runs by yourself. Go for it.